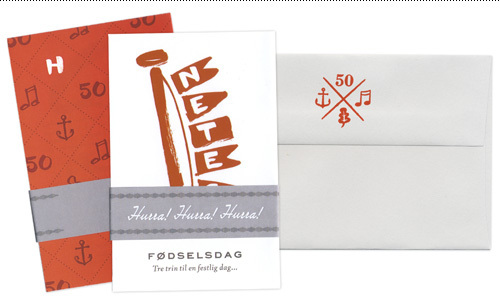 This summer my Aunt Nete is turning 50, and I am very excited to visit Danmark for the event. The Danes like to celebrate, and this will be no exception! The “three step” party will include a sailing trip on a boat named Dagmar, a luksus picnic at Skanderborg Sø, and finally a live band at their home terrace in Århus so everybody can really party down. 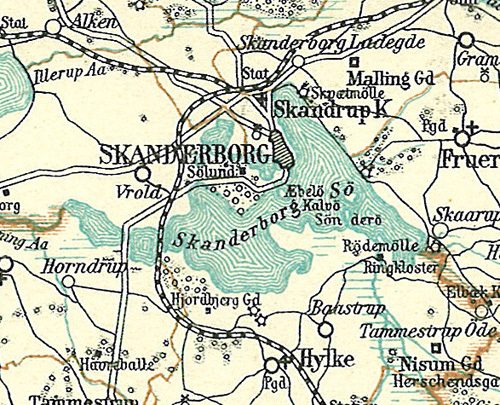 A map of Skanderborg Sø from the 1900s. Isn't Wikipedia great? Danish parties are a host of fond memories for me. I remember Nete’s 30th birthday party…as the night wore on my mom’s cousins Hans and Karl created a fun party game fueled by the genius-inducing-beverage snaps. To play this game, all you need is a standard bathroom scale. Contestants take turns holding the scale in their hands and squeezing it with all their Scandinavian might. You guessed it – whoever squeezes the most kilograms out of that scale wins. Skål! The invite was made on a budget using just my office printer, some A2 envelopes and a custom stamp from Stamp Connection. I fit the 5-panel accordion fold onto a tabloid size sheet and made a cute bellyband to seal the deal. 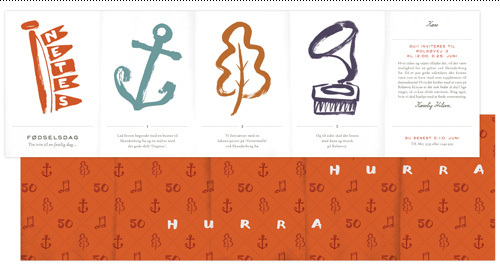 A tiny invite for a big party. And did we ever have fun! Love these, Mette! What a lucky aunt you have.